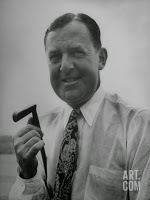 Following up "Uncovering the Real Bobby Locke" published here last month, John Coyne takes us on a mysterious search for the hickory-shafted putter used by Locke, the South African golf legend who won four British Opens and entered the World Golf Hall of Fame in 1977. This is the first of two parts. THE DAY OF BOBBY LOCKE'S near fatal accident, he played golf at Clovelly Country Club, near Cape Town with his nephew Alfred Pratt and two other friends. After the round, Alfred put his clubs and Locke's in the boot (as they say in South Africa) of Locke's Vauxhall Cresta and then the foursome went into the club's bar for a drink. At the time, Pratt said, "Locke was heavily involved in drinking," so a few drinks later, Pratt had enough and decided to leave his clubs in Locke's car and just walk home on his own. Later, he—and the world—would learn Locke and another golf pro, Maurice Bodmer, were injured when Locke's car was hit by a train at a rail crossing. It was February 1960 and both men were taken to the Groote Schuur Hospital. In the accident, Locke's clubs were scattered all over the road and adjacent verges. Bobby Locke's famous hickory shafted putter and his five iron went missing. "My own clubs," Pratt recalls, "had remained intact in the boot of the car but the bag was stained with Locke's blood. Bobby himself had been flung backwards through the rear windscreen and spread-eagled and bleeding across the boot lid." After the accident, Pratt put an ad in the local newspaper offering a reward of ten pounds for the return of the two clubs and they were returned. "It was a relief when the finder gave them to me," he says. "I gave the clubs to Locke and he continued to use them. The famous antique putter was in regular use and I played many rounds with Locke and he certainly had the real putter in his hands in the early nineteen-sixties." In 1963, Pratt emigrated to the UK and never physically handled or saw the putter again. "However, I have copied photographic evidence of his continued use of the putter into his advancing years." There is evidence, too, of Locke using the putter as seen in his autobiographical and golf instruction book, Bobby Locke on Golf published 1953. Then, on July 9, 1993, Pratt attended in London Christies' Bobby Locke Memorabilia Sale. He had planned to buy Locke's hickory-shafted putter as an investment and a keepsake until he saw and read in the brochure this description of Lot 120: "Bobby Locke’s Putter, a hickory shafted putter with silvered head and inscribed on the sole 'Bobby Locke' with lengthened and thickened leather grip, circa 1950” – expected sum £800 to £1000. The wording, Pratt thought, implied that the item was his regular putter and not another. It did sell at the auction for £2400 plus Value Added Tax but not to Alfred Pratt. "When I saw the item and the brochure photograph I did not make a bid. I knew for certain that Bobby Locke's putter was a rusty antique, which I had seen many times, as given to him by his father or by a friend Bob Weallans." Locke's putter, an individually hand-made antique, bore no names of the manufacturer. Pratt was convinced Christies was in no way to blame. "They took the item for sale described 'on trust' as authenticated by Locke's heirs, Mrs Mary Locke and her daughter Carolyn," explained Pratt. Later Carolyn Locke would confess in a golf journal interview that she and her mother had misrepresented the putters for sale. In an article that appeared in the newspaper it stated Miss Carolyn Locke, 33, confirmed that she had kept her father's famous putter, a non-named brand, hickory-shafted rusty-bladed golf stick given to him by his father." Carolyn and her mother would also donate or sell one of those replica putters to the St. Andrews Museum with a signed provenance that it was the putter used by Locke. The two putters on display there, however, are both shiny headed and inscribed with modern stampings and Locke's name. This means that neither can be the genuine object, according to Alfred Pratt. He might have used them or tested them but they are not the genuine article. Why is there such confusion and misrepresentation of Locke's famous hickory-shafted putter? John Coyne is a bestselling author of three golf novels and more than 20 other books. Pay him a visit at John Coyne Books.